Use the Fee Structure Calculator spreadsheet to help create your totals. Fee Structure Calculator Tax Amount Cost Category Price Qty Taxed Tax Amount Total Cost Cost Cost Cost Cost Cost Cost Total Costs Ongoing Yearly Costs Price Qty Taxed Tax Amount Total Cost Cost Cost Cost Cost Cost Cost Total Ongoing Yearly Costs Ongoing Monthly Costs Price Qty Taxed Tax Amount Total Cost Cost Cost Cost Cost Cost Cost Total Ongoing Monthly Costs Miscellaneous Costs Price Qty Taxed Tax Amount Total Cost Cost Cost Cost Cost Cost Cost Total Miscellaneous Costs TOTAL AMOUNT TOTAL MONTHLY AMOUNT TOTAL YEARLY AMOUNT Notes costs are taxed enter the tax rate then enter either the Taxed column. 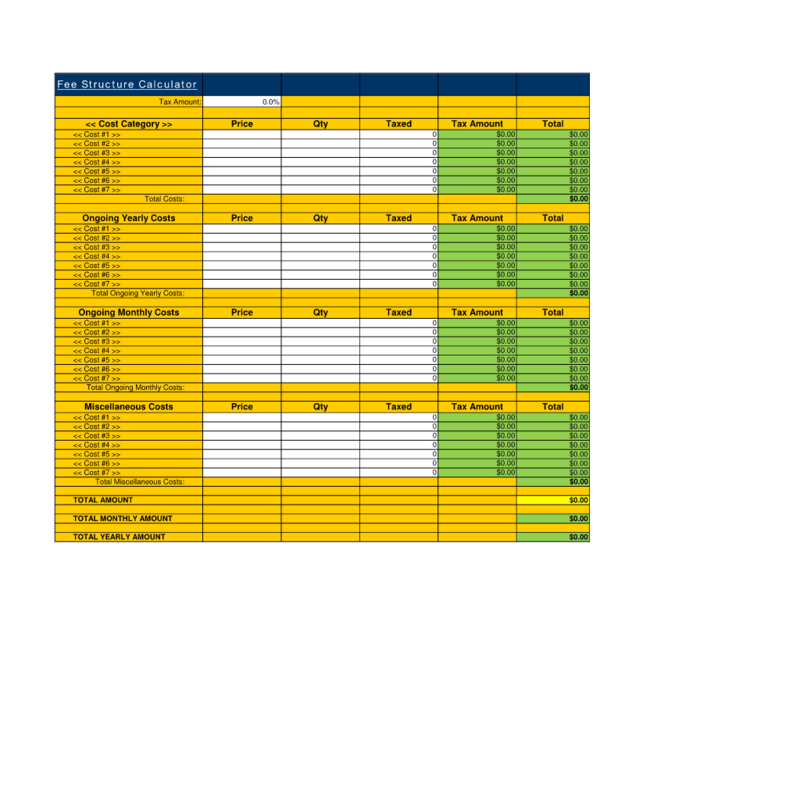 The editable Fee Structure Calculator - complete with the actual formatting and layout is available in the retail Proposal Kit Professional.